Have some fun in your backyard or at your next tailgating party with this tailgating table tennis table from Wild Sales®. The table is decorated with the team name and logo, and folds up for easy transportation. 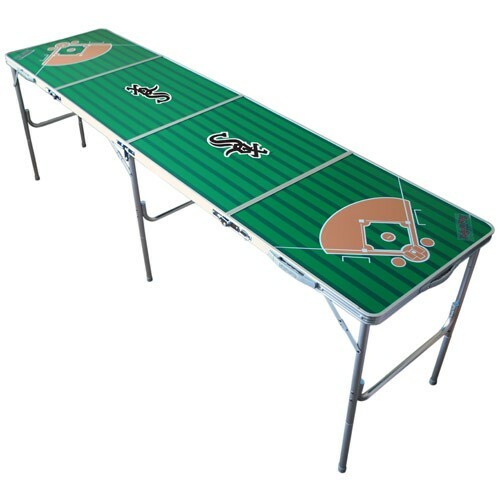 The Ultimate Table for Tailgating and Table Tennis. Great for outdoors, barbecues, sports and family functions. This 2'x8' table provides an extra two feet to a standard style table. The surface represents a baseball field. You simply fold up (to a 2'x2' size), grab the handle, and go. Light weight, sturdy aluminum design. The table converts to a portable tennis table with a net that secures to the sides for when the food is cleared.